Background and objective: Lumbar interbody fusion is the main surgical repair method for lumbar degenerative diseases. The best material for interbody fusion is autologous ilium, but its use is limited because of limited sources. Furthermore, autologous ilium implantation leads to the formation of osteophytes, which negatively affect bone healing. Inorganic osteogenesis-inducing scaffold material exhibits good biocompatibility and bone-inducing effects in posterior lumbar interbody fusion, with encouraging short-term outcomes. The present study will investigate the safety and long-term effects of inorganic osteogenesis-inducing scaffold materials versus autologous ilium in lumbar interbody fusion. Subjects and methods: This prospective, single-center, non-randomized, controlled trial will include 120 patients who receive treatment for lumbar degenerative diseases at the Department of Orthopedics, Beijing Tongren Hospital, Capital Medical University, China. These patients will receive lumbar repair surgery with inorganic osteogenesis-inducing scaffold materials (test group, n = 60) or autologous ilium (control group, n = 60). All patients will be followed up at 1 week, and 1 and 2 years postoperatively. This study was approved by the Medical Ethics Committee, Beijing Tongren Hospital, Capital Medical University, China (approval No. TRECKY2017-158) on September 28, 2017. Study protocol version: 1.0. All participants will provide written informed consent after fully understanding the study protocol. Results: The primary outcome measure of this study is the Oswestry Disability Index at 2 years postoperatively. The secondary outcome measures are the Oswestry Disability Index preoperatively and at 1 week and 1 year postoperatively, the Visual Analog Scale score, Japanese Orthopedic Association score, and lumbosacral angle preoperatively and at 1 week, and 1 and 2 years postoperatively, and the incidence of adverse reactions at 1 week, and 1 and 2 years postoperatively. 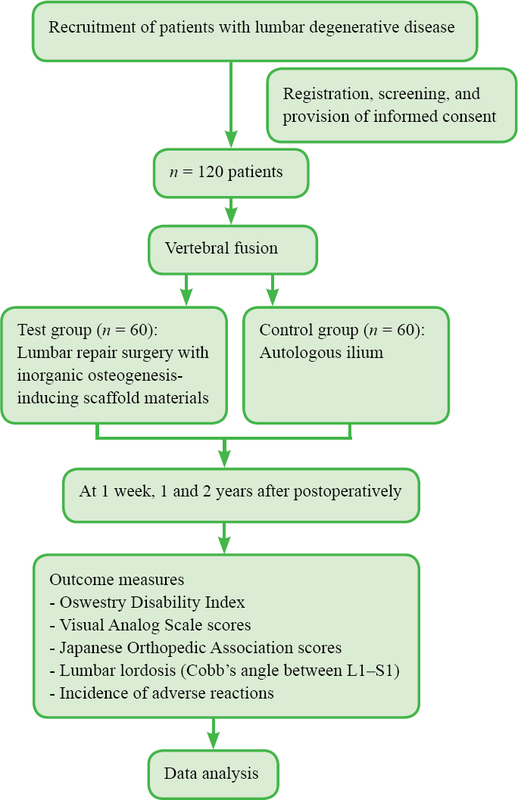 A pilot study involving 52 patients with lumbar degenerative diseases treated during 2016–2017 revealed no significant differences between the test (n = 32, 61%) and control groups (n = 20, 39%) in the Oswestry Disability Index, Visual Analog Scale score, and Japanese Orthopedic Association score at 1 week postoperatively; at 12 months postoperatively, plain radiography revealed bony fusion in both groups. Conclusion: This study will provide evidence to validate whether inorganic osteogenesis-inducing scaffold material results in similar long-term outcomes to autologous ilium in lumbar interbody fusion. Trial registration: This study was registered with the Chinese Clinical Trial Registry (registration number: ChiCTR1900021333) on February 15, 2019. Background and objective: The proximal femoral anatomical locking compression plate and proximal femoral nail antirotation device are commonly used in the treatment of long-segment comminuted subtrochanteric fractures of the femur. However, few studies have evaluated the difference in efficacy and safety between these two implants. The present study is being performed to compare the efficacy and safety of the proximal femoral anatomical locking compression plate versus proximal femoral nail antirotation in the treatment of long-segment comminuted subtrochanteric fractures of the femur. The results will be used to identify the optimal implant treatment plan. 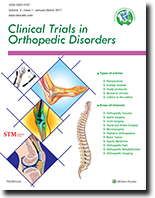 Participants and methods: This prospective, single-center, non-randomized controlled clinical trial will include 180 patients with long-segment comminuted subtrochanteric fractures of the femur from Sanya Traditional Chinese Medicine Hospital, China. The patients will be equally divided into a locking compression plate group and a proximal femoral nail antirotation group. All patients will be followed up at 2 and 10 months postoperatively. Patient recruitment and data collection will begin on June 30, 2019 and end on June 30, 2020. Analysis of the results will be performed from 1 to 30 July 2020. This study will be scheduled to end on August 1, 2022. This study was approved by the Medical Ethics Committee of Sanya Traditional Chinese Medicine Hospital in China in March 2013 (approval No. (2013) (02)). Study protocol version is 1.0. This study will be performed in strict accordance with the Declaration of Helsinki formulated by the World Medical Association. Written informed consent regarding the study protocol and surgery procedure will be obtained from the participants. Results: The primary outcome measure is the rate of excellent and good Harris hip scores at 10 months postoperatively; this rate will be used to evaluate the recovery of hip function after repair. The secondary outcome measures are the rate of excellent and good Harris hip scores preoperatively and 2 months postoperatively, intraoperative blood loss, operation time, incision length, hospital stay, fracture healing time, hip morphology on radiographs preoperatively and 2 months postoperatively, and incidence of adverse events 2 and 10 months postoperatively. Our pilot study involved 80 patients with long-segment comminuted subtrochanteric fractures of the femur from February 2013 to February 2016 (locking compression plate group, n = 40; proximal femoral nail antirotation group, n = 40). The 10-month follow-up results showed that the intraoperative blood loss, operation time, incision length, hospital stay, and fracture healing time were lower in the proximal femoral nail antirotation group than in the locking compression plate group (P < 0.05). The rate of an excellent and good Harris hip score was higher in the proximal femoral nail antirotation group than in the locking compression plate group (P < 0.05). The complication rate was lower in the proximal femoral nail antirotation group (10.0%) than in the locking compression plate group (12.5%) (P > 0.05). These pilot study results verified higher efficacy and safety of proximal femoral nail antirotation than locking compression plate fixation in the treatment of long-segment comminuted subtrochanteric fractures of the femur. 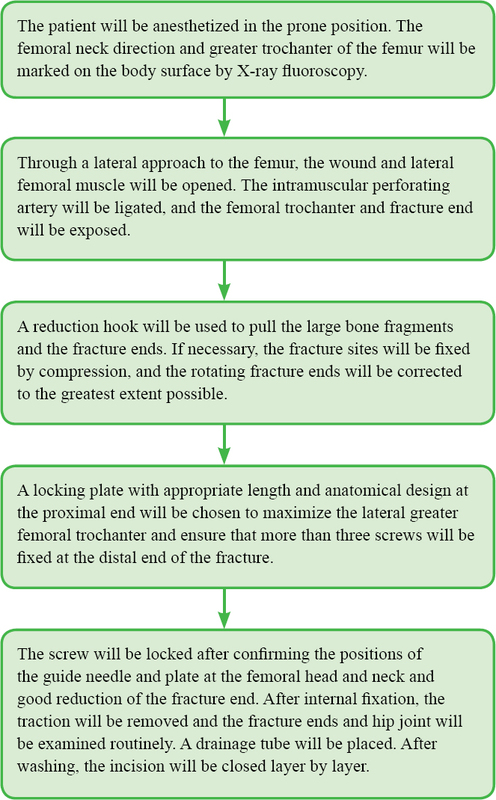 Conclusion: The results of the present study will provide evidence indicating whether proximal femoral nail antirotation in the treatment of long-segment comminuted subtrochanteric fractures of the femur can facilitate better recovery of hip function and higher safety than anatomical locking compression plate fixation. Trial registration: This study was registered with the Chinese Clinical Trial Registry on February 3, 2019 (registration number: ChiCTR1900021251). Background and objectives: Numerous studies have shown that tranexamic acid effectively reduces the amount of bleeding and drainage, and reduces the blood transfusion rate during and after various operations. The present study aims to investigate whether tranexamic acid effectively reduces the amount of bleeding during and after pelvic fracture surgery. Subjects and methods: This prospective, single-center, randomized, parallel-controlled trial includes 70 patients with pelvic fracture who received treatment from April 2015 to January 2017 at the Department of Orthopedics, General Hospital of Western Theater Command, China. These patients were randomly divided into a tranexamic acid group and a control group. Fifteen minutes prior to the skin incision, the tranexamic acid and control groups respectively received an intravenous infusion of 100 mL normal saline alone or with 10 mg/kg tranexamic acid. Patients were followed up at postoperative 1, 3, and 5 days. This study was approved by the Ethics Committee of the General Hospital of Western Theater Command on February 16, 2015 (approval No. 2015-keyan-04). All patients provided written informed consent for study inclusion. Data collection: April 1, 2015 to January 30, 2017; study completed: March 31, 2017; study status: completed with data analysis ongoing. Outcome measures: The primary outcome measure is intraoperative blood loss, as a measure of intraoperative hemostasis. The secondary outcome measures are intraoperative blood transfusion, drainage volume at postoperative 1, 3, and 5 days, and hemoglobin level, D-dimer level, international normalized ratio, prothrombin time, and activated partial thromboplastin time preoperatively and at postoperative 1, 3, and 5 days. 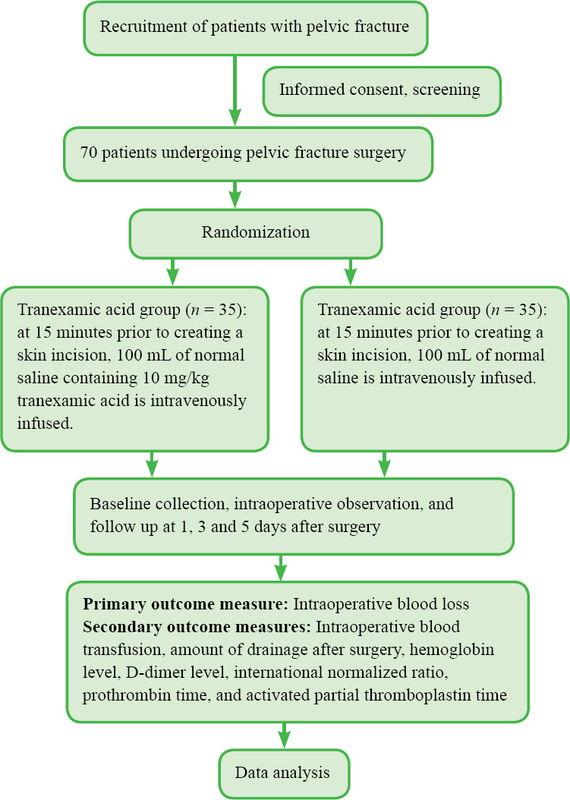 Discussion: This study will provide evidence to validate whether intravenous tranexamic acid administered 15 minutes prior to pelvic fracture surgery reduces intra- and postoperative bleeding. Trial registration: This study protocol was registered with Chinese Clinical Trial Registry (registration number: ChiCTR-ICC-15006070) on March 13, 2015.